Name - Spathi means spathe (part of the sail-like "flower"); phyllum means leaf = spathe like a leaf. Origin - South and Central America. Care Tips - Plants will droop when they need watering - but try to water them before they do this! 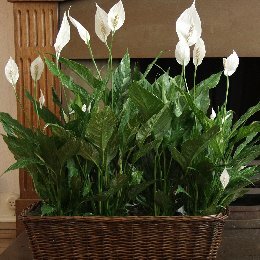 Peace lilies are unlike other plants in that if they are reluctant to flower, put them somewhere less bright. Most other plants will flower better when the light is brighter. Trivia - Currently second most popular houseplant in the UK according to F&PA surveys.